The reconfigured La Ciotat dry dock was officially opened earlier this week (April 3) and will now welcome its first customer, the 72 metre Delta Marine superyacht Albatross. Last month, the Spanish refit yard MB92 was announced as a key partner for Blohm + Voss La Ciotat, which has signed a 35 month lease on the site. This strategic partnership will see MB92’s significant order book of superyacht refit projects rapidly transferred from Barcelona to the South of France. At the official opening, it was confirmed that Miquel Angel Lliteras has been appointed as shipyard manager for Blohm+Voss La Ciotat, while Jean-Gabriel Tridon will act as the general manager. Peter Lürssen, CEO of the prominent German superyacht builder, was also present at the ceremony. MB92, which recently celebrated its 25th anniversary, has more than 20 years' experience working with Blohm+Voss’s new parent company Lürssen. 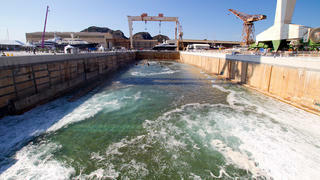 The new arrangement at La Ciotat Shipyards takes the number of major superyacht refit companies in the port to three, with Compositeworks and Monaco Marine also having facilities on site. As part of the work, the dry dock has been reconfigured to measure 200 metres by 60 metres. 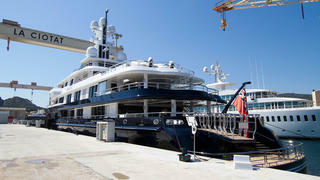 With a maximum vessel length of 195 metres, it will be capable of servicing the world's largest superyachts. La Ciotat Shipyards is continuing to develop the few last free spaces available on the site and is looking at the possibility of installing a 4,000 tonne lift.